FORT WORTH, April 2, 2019 – An affiliate of Starwood Capital Group, Crescent Real Estate LLC (“Crescent”) and High Street Real Estate Partners announced today that they are developing 721 hotel rooms on a 1.3-acre parcel of land directly across from Nashville’s Music City Center, a $625 million convention center. 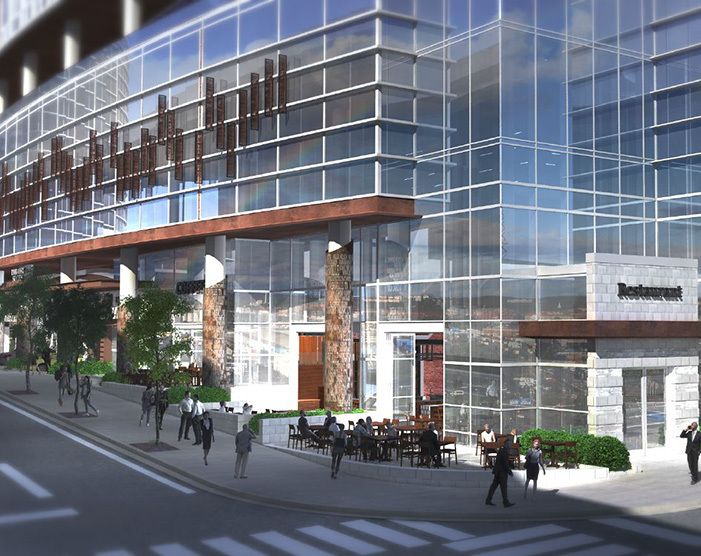 The hotel design includes a common podium with two hotel towers joined by a four-story lobby, conference area and public restaurant/retail space, including outdoor street-level public dining and a rooftop bar. The dual-branded development consists of a 1 Hotel, Starwood Capital Group’s award-winning luxury, eco-conscious and lifestyle brand hotel eco-friendly luxury hotel brand, and Embassy Suites with over 32,200 square feet of meeting space (including pre-function space). The 30-story Embassy Suites by Hilton hotel tower will feature 506 rooms and rooftop swimming pool, bar and fitness center. The adjoining 18-story 1 Hotel tower will include 215 rooms with a wellness spa, as well as a rooftop bar and event deck area. Located on a half-block location on the north side of Demonbreun Street between 7th and 8th Avenues, an area known locally as SoBro, commercial real estate experts consider the property one of the most desirable blocks in the “cool and hip” downtown Nashville landscape. The new hotels will sit directly across the street from the front doors of the 2.1 million square foot Music City Center (MCC), providing convenient access for convention goers. MCC is a hotel room demand generator for downtown Nashville, which now can compete for 75 percent of the nation’s convention business. Additionally, 1 Hotel and the Embassy Suites will be just one block from the Bridgestone Arena, home of the Nashville Predators, and host to numerous concerts and events. The hotel’s close proximity to Broadway provides easy access to a wide variety of downtown restaurants and entertainment venues. “We are excited to invest alongside our partners in Nashville, one of the most vibrant hotel markets in America with diverse and rapidly growing demand drivers. We believe the distinctive 1 Hotel will stand out in a great, vibrant market with limited product differentiation,” said Barry Sternlicht, CEO of Starwood Capital. “We are excited to enter one of the country’s hottest markets, Nashville, with two excellent hotel brands and a strong and experienced partner in Starwood Capital Group. Our team is thrilled to embark on this world-class project. The combination of 1 Hotel and Embassy Suites fits the Nashville hotel market perfectly and provides a compelling opportunity for our investors,” said Jason Anderson, Co-CEO of Crescent. Nashville is consistently recognized as one of the strongest and fastest growing economies in the Southeast. Driven by healthcare, automotive and music industries, Nashville continues to be on the top lists of places to live and work, and annually finds itself as a top travel destination. Consistent expansion in healthcare and corporate operations, stable state government, and continuing excellence in educational institutions attract residents and visitors to the city. The city’s mix of history, music industry venues and events, and family attractions provide a high quality of life that attracts residents and brings visitors to the region. The city’s metropolitan area drew 15.2 million leisure travelers in 2018, up 5.0% from the 14.5 million leisure travelers in 2017 that was up 4.6 percent from 13.9 million visitors in 2016. Nashville tourism leads to a seven-day-a-week market for hotel room demand with visitors generating $6.5 billion dollars in tourism revenue annually. Economic impact from 2018 will be released in the summer of 2019.